FIREWORKS ARE DANGEROUS – and if you don’t have a licence, you could end up paying a fine for using them. That was the message from Minister for Justice Alan Shatter as he drew people’s attention to the dangers and penalties associated with the illegal use of fireworks, and urged the public not to use them. Fireworks are often used at Halloween time, but without a licence it is illegal to use them. Unfortunately at this time each year a number of people are injured, some badly, as a result of the misuse of fireworks. Many of these casualties are children or teenagers who in some cases lose fingers or even hands and can also suffer serious burns or eye injuries. Licences under the Explosives Act 1875 are only issued by the Justice Department for the importation of fireworks which are to be used in organised displays run by professional operators. 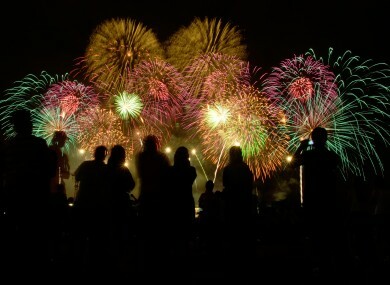 The Minister encouraged “anyone who wants to enjoy the spectacle of fireworks to attend such events, where possible”. Fireworks, except for the likes of sparklers and party poppers, are not permitted to be sold to the general public. The law in recent years has been tightened, so the gardaí now have extra powers to conduct searches of people and vehicles suspected of carrying illegal fireworks with intent to sell or supply. If you are convicted of having illegal fireworks in your possession, you can be fined up to €10,000. Penalties of up to five years’ imprisonment apply to the possession of illegal fireworks with intent to sell or supply, and to igniting the fireworks or throwing an ignited firework at a person or property. An Garda Síochána launch a policing operation in the run up to Halloween each year, called “Operation Tombola”. People who are suspected of being involved in the importation, supply or sale of illegal fireworks will be identified and targeted by the gardaí, and intelligence-led operations and searches will be conducted. Meanwhile, Greyhound is advising people to be “extra vigilant” with their bins over the Halloween period. It has sent emails and text alerts to its customers, asking them to be particularly careful when storing bins over the next week. Michael Buckley, CEO of Greyhound, said that in the last number of years they have noticed a “distinct increase” in the number of bins being stolen and thrown onto bonfires”. He encouraged people to pay extra attention to their neighbours, particularly the elderly or infirm, who may need help storing their bins in a secure place on their property. Email “Warning over fireworks danger - and €10,000 fine for using them illegally”. Feedback on “Warning over fireworks danger - and €10,000 fine for using them illegally”.